Mr Ang Lu Heng is a rare sort of 79-year-old. 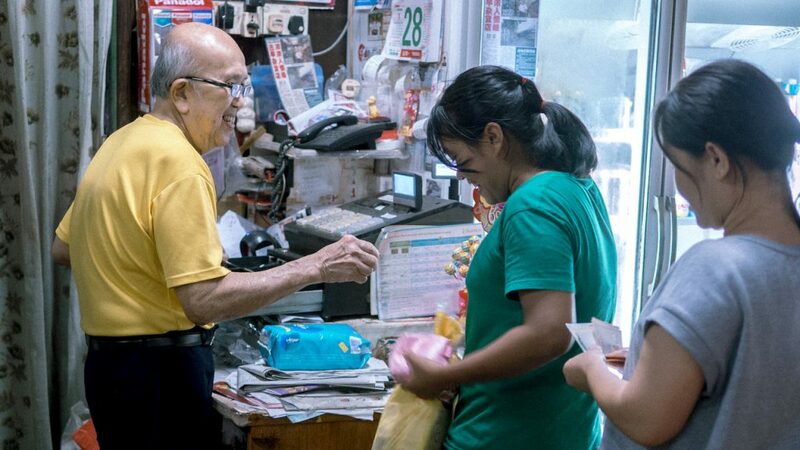 Together with his wife, he lives where he’s worked for over 60 years: in Singapore’s last provision shop set in a home. The zinc-roofed space—framed by a green wire fence and stacks of flattened cardboard boxes piled in front shelves of bread and bottled drinks—is so unassuming that I miss it at first, mistaking Tee Seng Store for an abandoned junkyard in the mostly polished residential area skirting Rosyth Road and Sandilands Road. “I’m busy,” he announces in Mandarin as I enter, offering me a tentative smile before squeezing past to unpack tins of canned food from a cardboard box in the dimly lit space. 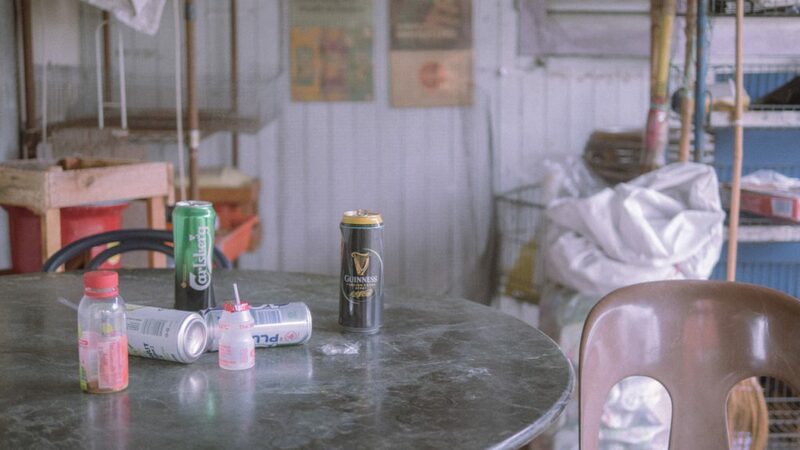 I’ll wait, I tell him, before retreating to the shopfront, where I arrange myself on one of two stone tables blanketed with discarded beer cans. These very tables are where his customers used to unwind over drinks in the ’60s, chatting under the milky moon until the store shuttered for the day at midnight. The neighbourhood, all well-paved roads and rows of modern landed homes, was once a bustling village set with gravelly paths and one-level homes identical to his. Mr Ang shares this with me in a mixture of Mandarin and English when we sit on grey plastic stools beside the cash register, where much of his day has revolved since he was 15. 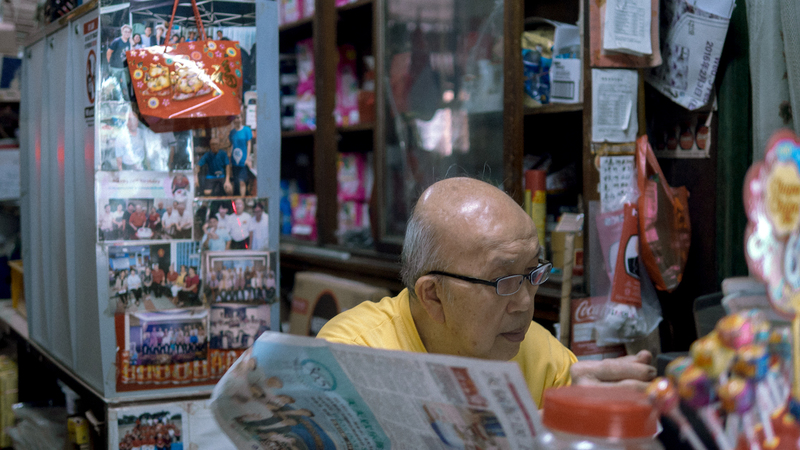 In 1955, a year after his graduation, he found work as a shop assistant under the care of his former boss at Tee Seng Store. Because his parents were odd-job workers, their sporadic income was only sufficient to put him through primary school. At this, he directs me to the photos tacked to the fridge in front of the cash register, and extracts himself from his seat with a kind of renewed animation. 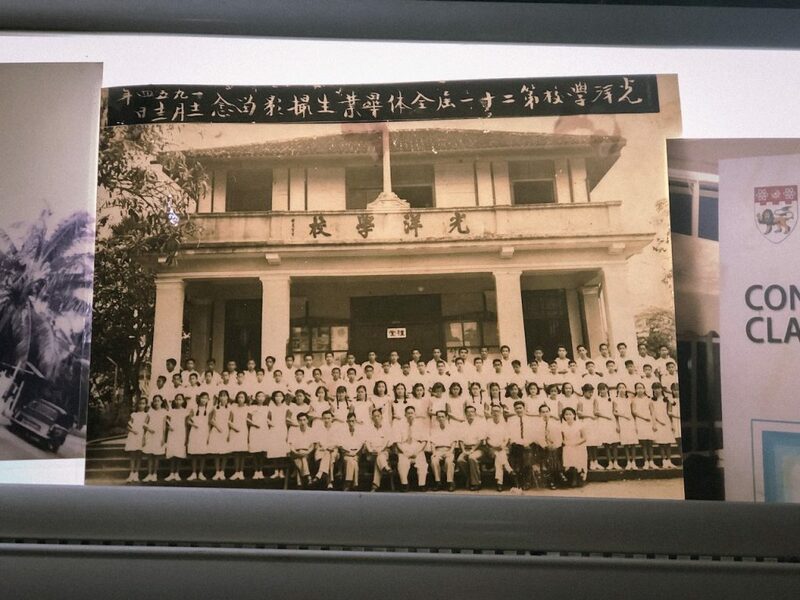 “Can you guess which one’s me?” he nods towards a black-and-white school picture taken in 1954, the year he graduated from Guangyang Primary School, which has since relocated from Yio Chu Kang to Bishan. 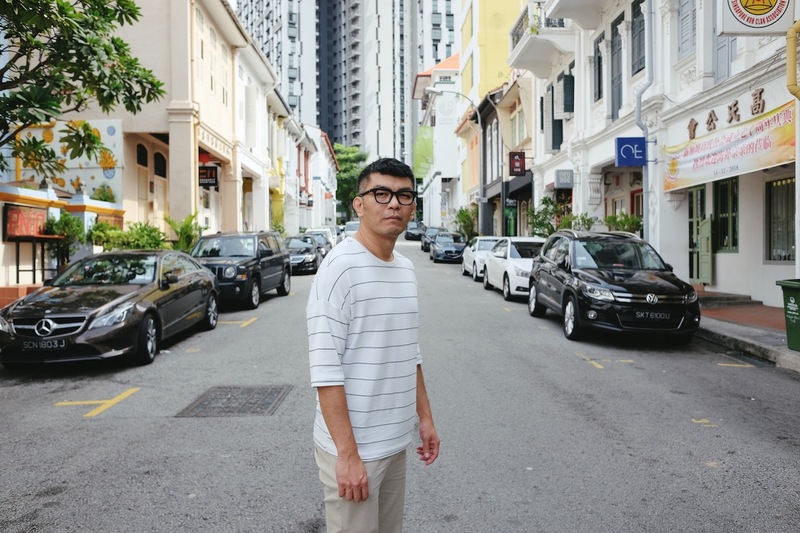 After five years under the former Tee Seng Store owner, Mr Ang acquired the business for a “small fee”, a number he can no longer recall. With it came the 6,000 sq ft plot of land that’s today carved into three parts: the bedroom, shop, and kitchen. The Angs’ bedroom sits to the left of the cash register, partitioned by a thin curtain, and on two sides of the store are entrances to the kitchen and storeroom. 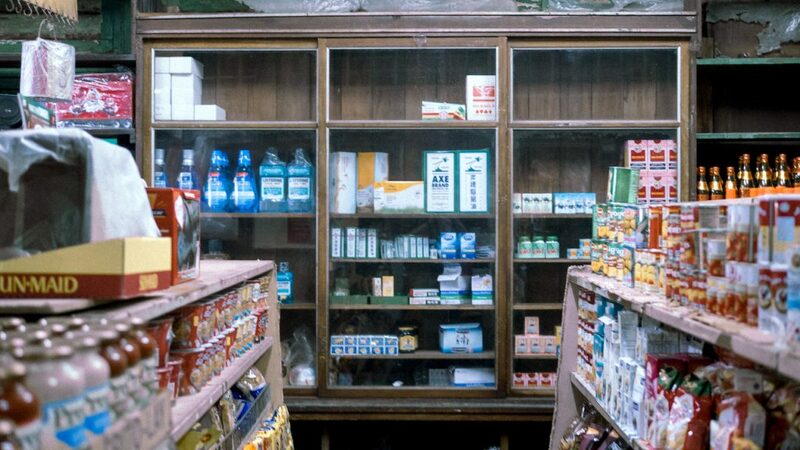 The store itself brims with furniture dating to the provision shop’s early days. 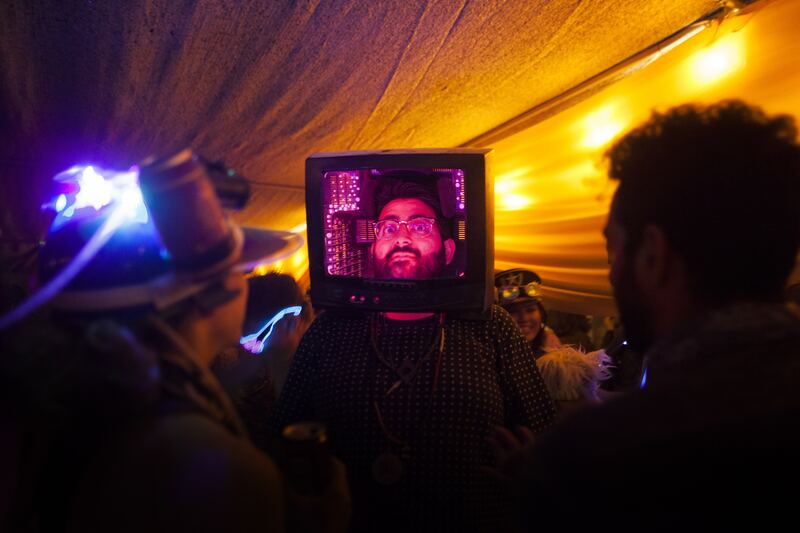 Kitschy Coca-Cola trays adorn the walls; packets of chips have been placed in defective refrigerators; a dated, oversized radio sits on an aged shelf, the fuzzy strains of a Chinese New Year track streaming from its speakers. 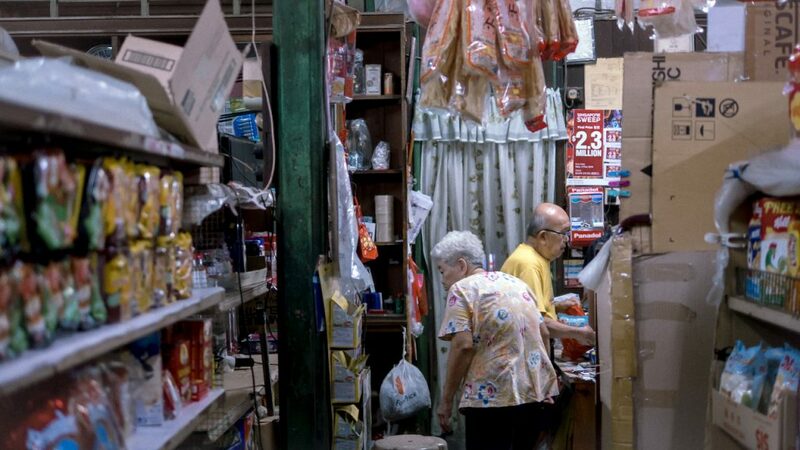 It occurs to me how remarkable it is that Tee Seng Store has remained physically unchanged in all the years gone by. I comment on the high value his plot of land holds, given its size and location, and Mr Ang chuckles. The hefty chunk of their lives they’ve spent within this same space includes taking all three meals at home every day, most of which are cooked by Mrs Ang using provisions from the store itself. This eliminates the need to even visit a supermarket, even though prices may sometimes be lower there, given they are run by larger corporations that enjoy greater bulk discounts. 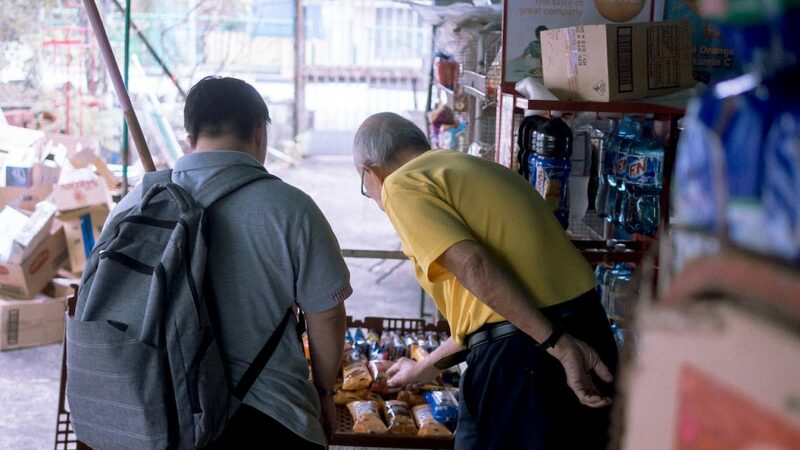 It’s clear the couple’s days are shaped by a routine they aren’t about to break: Mr Ang rises at 6 AM daily to restock his shelves with fresh loaves of bread, has breakfast, then goes for qigong with regulars who live around the Rosyth Road area. 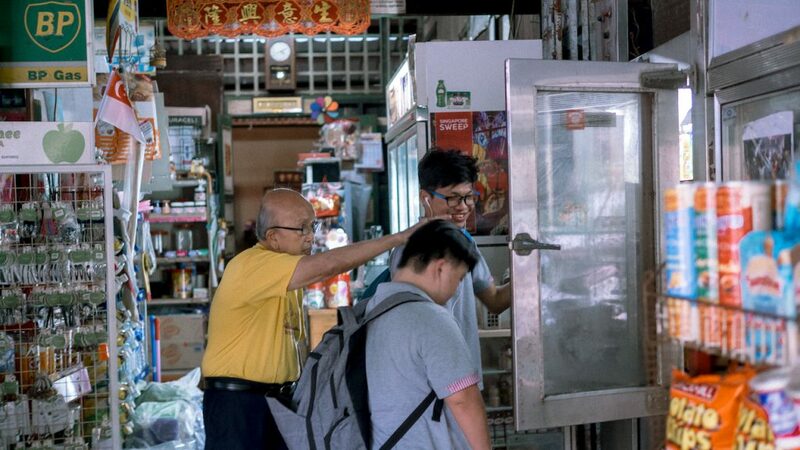 By 8 AM, Tee Seng Store is open for business; a silent, well-oiled machine kept alive by occasional purchases from nearby residents and domestic helpers. 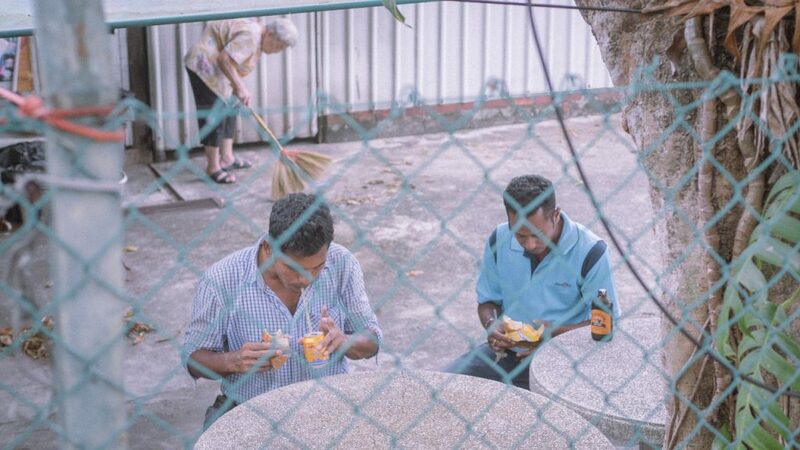 It’s a stark difference from an earlier time when Indians and Malays formed the bulk of his customer base—an unsurprising fact, given mama shops were birthed in the Serangoon Road area in the 1900s by Indian immigrants when Singapore was under British rule. With the relocation of residents to Housing Development Board (HDB) flats from 1961, mama shops shifted to void decks to serve a wider mix of ethnicities. It was perhaps a saving grace; today, provision shops based in common areas of HDB flats enjoy several concessions that Mr Ang does not. These include the Revitalisation of Shops (ROS) scheme, which subsidises up to $35,000 of a store’s renovation fees, along with a month-long rent-free period to lighten the costs of upgrading works. Mr Ang seems unenthused when I mention the scheme. It’s a Saturday morning, and customers stream in every ten or so minutes to buy milk, bread, bottled drinks, and canned food. 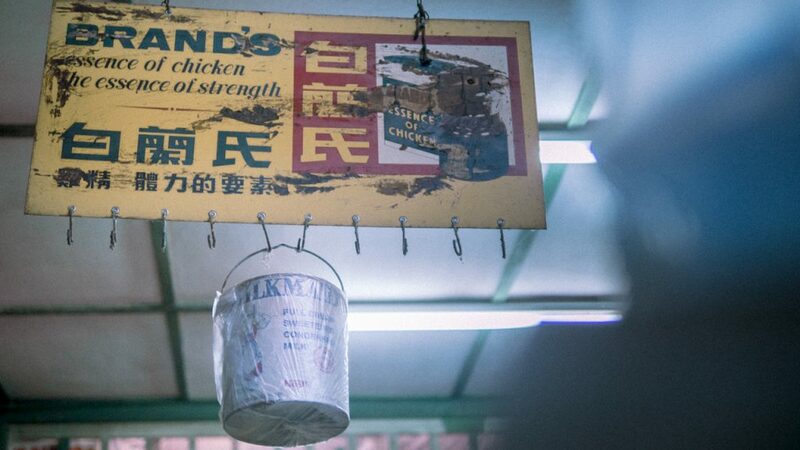 Each time, Mr Ang fluidly switches to the customers’ native tongue, a mark of his time growing up in pre-independence Singapore. “I’ve picked up many languages over the years,” he says with pride. While he used to make regular trips to Beach Road to purchase produce such as green chillies, onions, and potatoes, a dwindling customer base means he now has a supplier deliver a far smaller order based on demand. 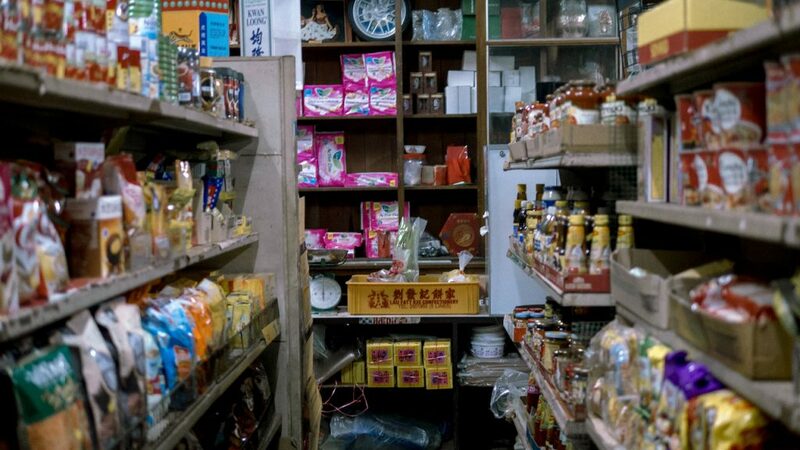 The sale of cigarettes and rice, though seemingly minuscule in value, are the primary products that keep the provision shop afloat—enough to pay off Tee Seng Store’s suppliers and utilities, which come up to some $700 monthly. Though Mr Ang prefers not to go into specifics, he shares that they set aside the remaining amount of somewhere between $400 to $900, portioned for everyday use and savings. The couple have no CPF, nor does Mr Ang plan to retire any time soon. Instead, they rely on the modest amount to get by comfortably. I probe him further on any future retirement plans he may have. A holiday, perhaps? The idea sounds foreign and ridiculous, even to my ears. And I’m not off the mark: Mr Ang and his wife haven’t travelled for as long as he can recall, and they truly do intend to stay on in this home for the rest of their lives, even after the provision store has shuttered. “That will only happen when I no longer have the energy to run this place,” he asserts. In fact, the last holiday he took to Thailand was a paid company trip while he was working on the side as a gas tank delivery man, a time so far back that he struggles to recall when exactly he took the trip. It’s not an uncommon sentiment among older folks; to remain where one is most comfortable. Singapore’s rapid shifts in development haven’t put a dent on Tee Seng Store, and it resembles a home that’s been airlifted from the ’50s and plonked into its current space, an anomaly of wooden louvres, battered shelves, and dated appliances. The provision shop has no official website, nor does it accept any form of payment other than cash. 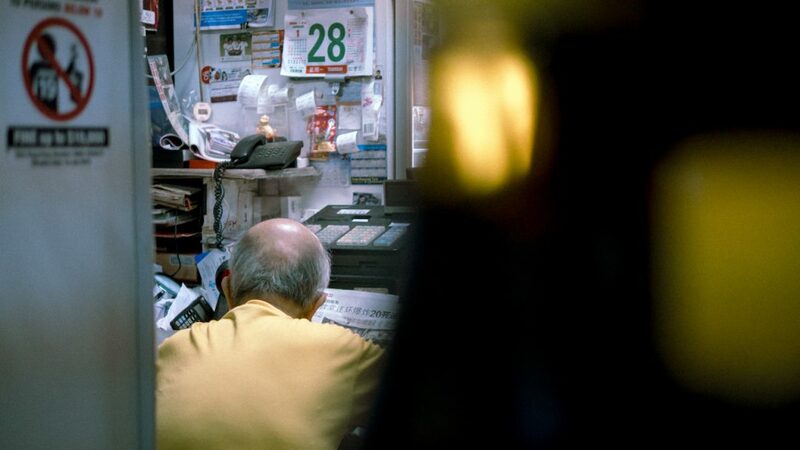 After years of relying on a tin can pulley system, and tracking his accounts with an abacus and handwritten invoices, Mr Ang only made the switch to a cash register in 2007, while the rest of the nation sped ahead with its shiny buildings and land reclamation projects. Evidently, Mr Ang is disinterested in keeping up with the times, perhaps owing to the fact that he is well aware Tee Seng Store will go the way of back alley barbers and streetside cobblers. “My children wouldn’t take over my business, much less my grandchildren. It’s hard work. Far too tiring for them,” he says. No surprise there; traditional provision stores, once central to the livelihoods of residents residing in villages, now serve primarily as relics of our city’s past. A family of tourists in straw hats ambles in at this point, the youngest boy touting a camera around his neck. “Looking for chocolate,” one of them announces, excitedly pointing to the fridge within which trays of Kit Kat and Kinder Bueno sit. It turns out they’re Vietnamese, whose language he can’t speak. But he perseveres anyway, filling the gaps in conversation with gestures before pausing to take a picture with them. Mr Ang with a customer. 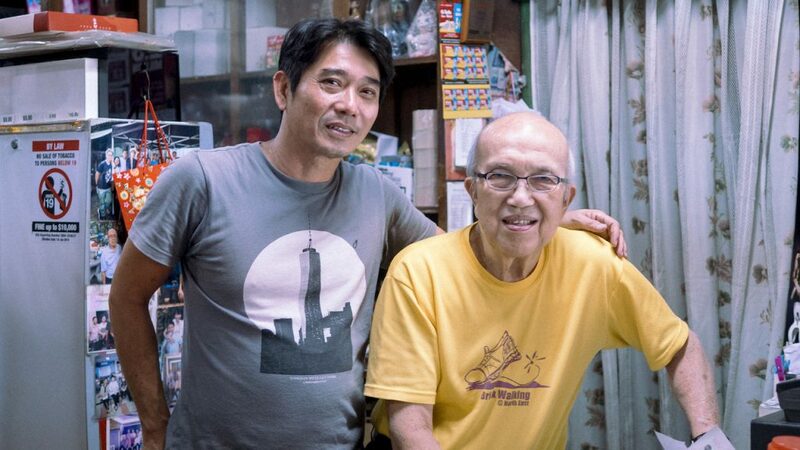 There’s something extraordinarily endearing about Mr. Ang; not simply the fact that he’s lived and worked in the same space for over 60 years, but that he seems genuinely interested in his customers’ lives. After lingering in Tee Seng Store for close to an hour, my ears become attuned to the sounds Mr. Ang must be so familiar with: the crackling of the radio over the gentle hum of a stationary fan; the shuffling of footwear as customers come and go; the staccato beeping of goods being scanned; the coo-ooh of mynahs outside announcing their presence—and, above this buzz of life from the inanimate and animate—the satisfying click of the cash register, marking another transaction. With the height of provision store businesses dipping from 3,000 in the 1980s to just under 200 today, these figures from the Singapore Provision Shop Friendly Association are proof that the business model of yore is no longer a sustainable one. It strikes a chord in my very millennial soul; this determination to keep at something that was birthed out of necessity rather than a dream. Know places like this? Share them with us at community@ricemedia.co.